Okay so, I had a super fun find while refoldering and adding admiralty cases to the database a few weeks ago. Admiralty cases, remember, are those relating to the Great Lakes and are heard in federal court, specifically the Northern district of Ohio, Eastern division (Cleveland). Anyway, the first case I opened on Tuesday morning after I got to work was number 3206, “In the Matter of the effects of Frank Holmes, deceased seaman, late a member of the crew, A. W. Osborne.” Evidently, Mr. Holmes drowned on July 30, 1934 (sad). His effects stayed with the case because his family (if he had one in the states) was never located. The master of the steamer, W. G. Coles, sent a statement and Holmes’ personal effects to Vance & Joys Company, a vessel agent for the Wilson Transit Company, on December 23, 1934. In his personal effects were several neat objects: A pocket watch, an envelope from the Seamen’s Church Institute of New York containing discharge slips from the various ships of which he was a crew member, a blue membership book to the International Seamen’s Union of America, and a leather US Army Honorable Discharge folder containing his discharge papers (duh) AND his certificate of naturalization (OMG)! The education director agreed with me that this was some pretty cool stuff (seriously, who keeps their naturalization certificate in their Army discharge folder? but then again, where else would he have kept it?) so she went ahead and tracked him down through his Petition of Naturalization and his Declaration of Intent. Word got around that I’d found a fun case, which usually doesn’t happen. Admiralty cases are pretty unexciting- libel for injury or wages, accidents caused by some ship or company or whathaveyou hitting another ship or something… I actually came across a case where a tug was escorting a steamer in the fog, blowing its foghorn like it should, and some stupid person on the shore started honking his horn even though he had absolutely NO IDEA what that would mean to the ship. The tug noticed how far in they were and tried to turn around but the large steamer, alas, hit ground, causing all sorts of problems. The steamer’s company sued the poor man who had been honking his car horn- but seriously, what a maroon (why, yes, that was a Bugs Bunny reference)- anyway, there were all sorts of appeals, it was actually a pretty interesting progression. But I digress…so, anyway, all day long staff members would stop by and say, “So, tell me about this Frank Holmes guy…”So, let me tell you about Frank Holmes. 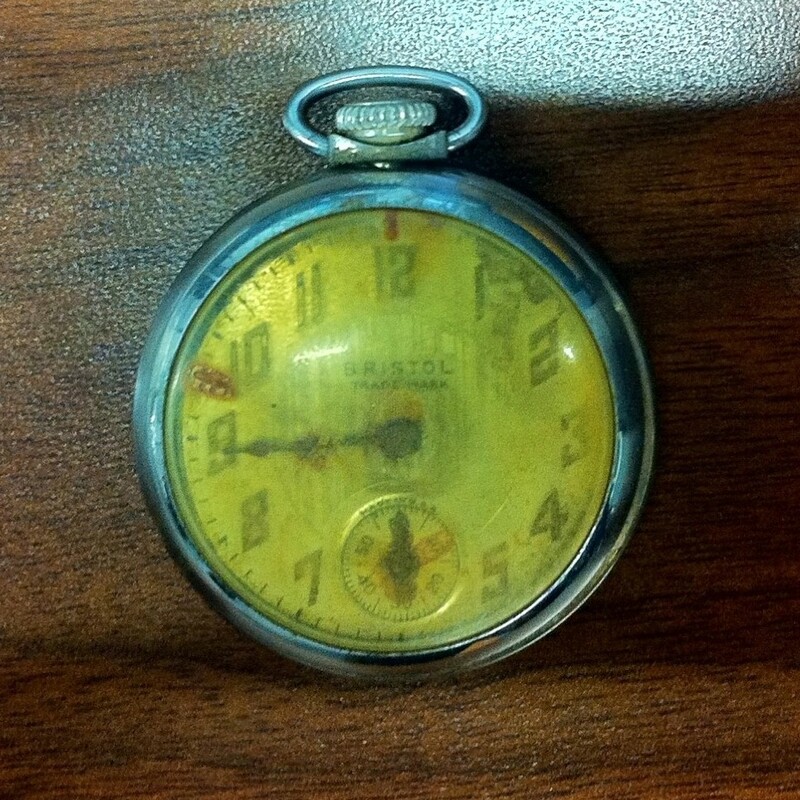 But first, check out his Bristol pocket watch! Anyway, according to his petition for naturalization, he was born in Stockholm, Sweden on July 31, 1880 and emigrated to the United States from St. Johns, Canada on October 15, 1905 (at 25 years of age) through the port of Provincetown, Massachusetts on the vessel Ellwood Burton. His Petition for Naturalization and Declaration of Intent are dated September 22, 1926 (making him 46 years old). Between coming to the United States in 1905 and applying to be a citizen in 1926, we know a few things about how Mr. Holmes kept himself busy. 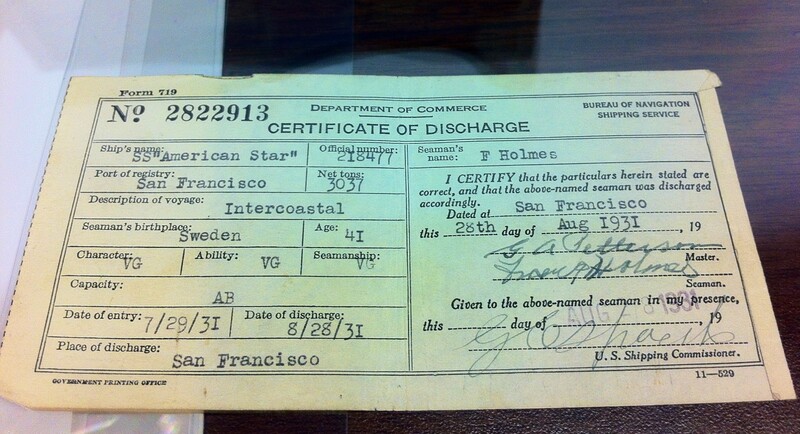 First let’s look at the various forms of discharge in his possession: ship discharge certificates and his US Army Honorable Discharge papers. The discharge certificates that were in his effects at the time of his death begin in 1915 and end at the year of his death in 1934. Discharge certificates are intriguing; there is A LOT of information on them that helped the Department of Commerce track every voyage. They document information about the ship, such as the ship’s name, port of registry, net tons, voyage description, place of discharge and the dates of entry and discharge. Information about each crew member is noted on the card, including the seaman’s name, age, and birthplace. It’s really interesting to me that the crew member’s character, ability, capacity, and seamanship were also documented on these certificates. The small certificates are signed by both the Master of the ship and the Seaman. Also, according to his Army discharge papers, Frank served on the home front in the Army Transport Service during World War I, from July 9, 1918 to October 3, 1918. With a “Bosun” rating and “Very Good” proficiency and conduct, F. Holmes was discharged in Lake Fernwood on October 3, 1918 because the shipment term ended. His certificate of naturalization states that Frank Holmes became a citizen of the United States on October 4, 1929 in Cleveland, Ohio at 49 years of age. If you noticed that I’ve been detailing dates and ages, there’s a good reason: Frank Holmes lied about his age. There are discrepancies between his official documents from the US government and his seafaring certificates. Unless the two different clerks who filled out his Petition for Naturalization and Declaration of Intention BOTH got his birth date wrong (which I highly doubt), Frank Holmes would have been 54 years old at the time of his death. “Well, where are these discrepancies?” you ask. Not counting every single one of his ship discharge certificates, two documents stand out as blatantly obvious. The first, his Certificate of Service to Able Seaman (which simply states that he has the experience and passed all the necessary health examinations to be a seaman), is dated THE SAME EXACT DAY as his Petition and Declaration, but says that he is only 36 years old. The second, his Seaman’s Protection Certificate (documents that he is now a naturalized citizen), is dated November 30, 1929, just one month after his Certificate of Naturalization, but says that he is 39 years old instead of 49. Really, Frank? Now, here’s where we start asking more questions. Did Frank Holmes lie about his age to the Department of Commerce (who issued the Certificate of Service to Able Seaman and the Seaman’s Protection Certificate)? Considering his naturalization documents would have been on file and he had in his possession the Certificate of Naturalization, this is highly unlikely. I’m more inclined to believe that he changed his age on his seamanship certificates after the fact. There is a slight discoloration and the area on the paper where his age is written appears to be rough, as if someone scratched at that area or was heavy handed with an eraser. Really, changing his age after he had all those documents in his possession would have been easy enough. Also, once he had those documents, they would not need to be double checked against his naturalization certificate. So another question: why would Frank Holmes feel the need to change his age? Maybe age was a factor no matter how good of a seaman someone was. Working on a ship was certainly no easy job; illness and injury were common. Perhaps because of this it was easier to get hired as a 39 year old instead of a 49 year old. Whatever the reason, I enjoyed getting to know Frank Holmes as best I could considering the circumstances, and I thank Mr. Holmes for his service in World War I, for being an upstanding seaman with “very good” character, ability, and seamanship, and (even though it certainly could not have been his intention) for brightening the- what would have been highly monotonous- day of an intern. This entry was tagged admiralty, Frank Holmes, Great Lakes, holdings maintenance. Bookmark the permalink. Those of us who do genealogy and family history know all too well that time stood still–or even reversed–the older an individual became. This wasn’t only true of a blue collar man seeking to make himself more employable, it also occurred with widowed housewives who would seemingly not find any benefit in being younger on a US Census enumeration. What is not clear is whether Seaman Holmes put himself in a situation that a younger sailor could have survived. Had Frank’s “very good” proficiencies from 15 years earlier been diminished enough to betray him that day in 1934? Asking those types of questions is what allows us to build stories and put flesh back on the bones of a person, something that is only capable via research of historic records. Thanks so much for sharing. Blessed be the name and memory of Seaman Frank Holmes. Public history MA student Jessica Hagen reconstructs portions of man’s rich life, using documents found during her NARA-Chicago summer internship. Chelsea Denault on The End Is Near!